The Berliner story is that local Herta Heuwer threw together a mixture of ketchup, Worcester sauce, and curry powder back in '49, and the currywurst was born, creating the city’s most iconic food that has since earned its own special cutlery (the currywurst fork! ), has a freaking museum entirely devoted to it, and spawned a rivalry with Hamburg over the true inventor (it's Berlin, trust us). We scoured the city for the hottest curry dogs (which you’ll find at Curry & Chili); locals head to Konnopke’s Imbiss for the classic version. It’s said that Turkish immigrant Kadir Nurman originally invented the döner kebab in the early '70s, turning the Turkish meat and salad -- which were typically served on a plate -- into a portable meal by stuffing them inside the fluffy bread. Today the döner is equally popular with Berlin’s massive Turkish population as it is w/ late-night revelers looking for a cheap meal. You’ll find them all over the city, but the line at Mustafas Gemüse Kabap is worth the wait. In Germany, you’re probably going to want to eat your weight in wursts, and in Berlin that means a bockwurst, invented in 1889 by a local restaurant owner who added pork to the classic veal bratwurst mix. 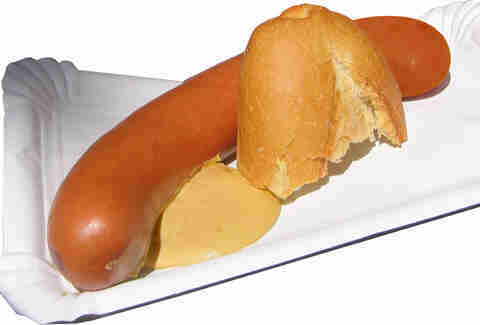 Today bockwurst is made using a whole zoo's-worth of meats, incl. pork, lamb, chicken & turkey, and there’s even a fish-only version. 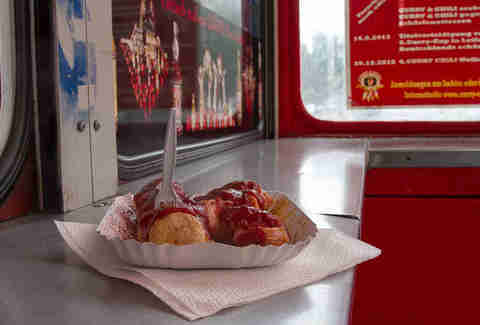 You’ll find them at most biergartens & currywurst stands incl. Curry 36; do it right and eat your bockwurst w/ a bock beer. Back in the late '70s, when that pesky non-Pink Floyd Wall was still around, the guys in charge of the former East had their own food think tank just to whip up new food items. What did they come up with? 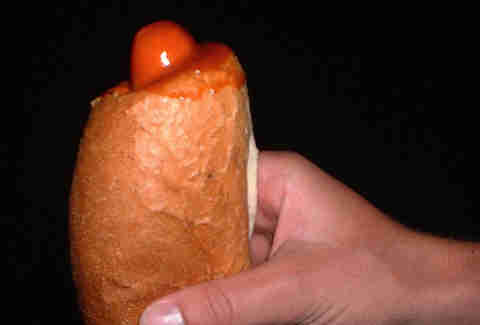 Hot dogs, covered in ketchup, and shoved inside a bun, which they named ketwurst by shortening ketchup + wurst (easy on the creativity there, fellas). Today you’ll find a few remnants of the GDR-era food still lurking around the city, including this Schönhauser Allee stand. A classic grandmother dish, “senfeier,” or "mustard eggs" is as simple as it gets -- hard-boiled eggs served with mashed spuds and covered in a creamy mustard sauce. Doesn’t sound appealing? Well the dish is a childhood throwback along the lines of PB&J for Berliners, and you’ll find it everywhere from lunch canteens like Kantine to Chef Tim Raue’s modern interpretation (w/ a poached egg!) at La Soupe Populaire. German cuisine falls heavy on the pork, the king of which is the knuckle. In Berlin, the oinktastic dish is called “eisbein,” or "ice leg" (oh-kay), and it’s boiled or steamed for several hours, usually in sauerkraut, giving it a nice pink glow. 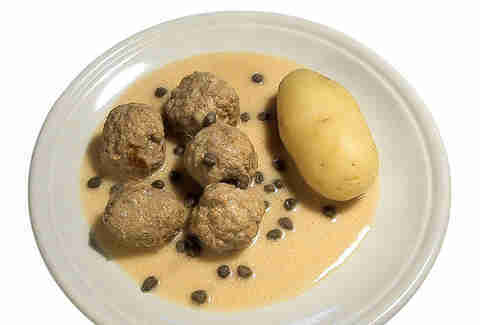 The dish is generally served with potatoes and Berliners also eat it with pea puree. Try it out at the city’s oldest restaurant, Zur Letzten Instanz, which opened in 1621, and has supposedly since served Napoleon, French prez Jacques Chirac & Jack Nicholson. These meatballs, named after the Prussian city they come from, are much-loved for their sauce; a creamy mixture of capers and lemon. 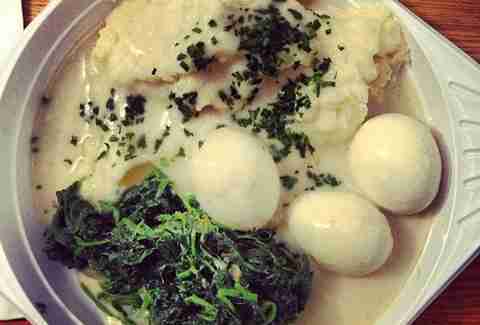 They are always served w/ mashed or boiled potatoes or rice and are dee-lii-cious. Get a taste at the Berlin classic resto Max und Moritz, where you can also gnaw away on eisbein. The classic Berlin schnitzel may be awesomely made w/ cow udder, but only a few daring Germans eat that these days. 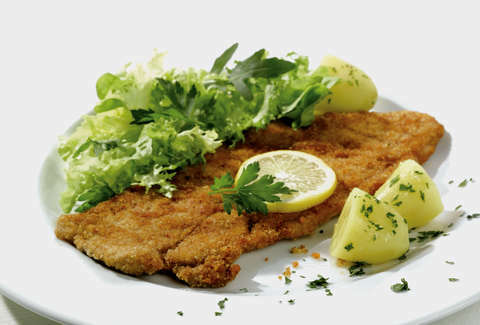 For another city take on the deliciousness that is breaded-and-fried meat, try the Schnitzel à la Holstein, which was drummed up at fancy resto Borchardt in the 19th century for the German diplomat Friedrich von Holstein. 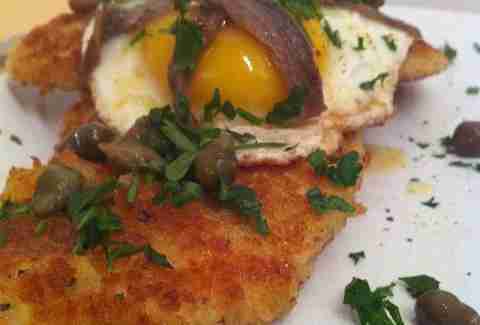 He must have been one adventurous eater: the traditional veal schnitz is topped w/ anchovies, a fried egg, and capers. When we start talking about German donuts, things get confusing. 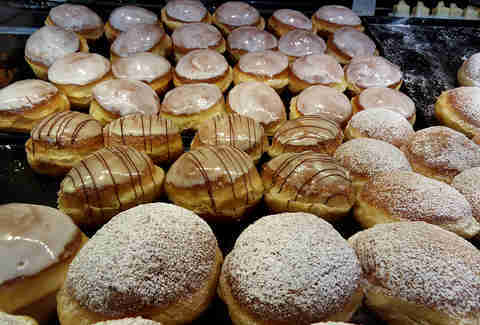 The word “Berliner” means donut -- specifically the jelly-filled variety -- but in Berlin they call them “pfannkuchen”, which means pancake everywhere else in Germany. Confused yet? On NYE, Berliners have this great tradition of putting one mustard-filled donut in the pile of jellies; the lucky recipient supposedly gets good luck for the year. The old-school Bäckerei Siebert is the place to get all the delicious, and non-mustard, flavors.